What is Safety Meeting Agenda? Safety issues are prevalent everywhere, whether you are at home, office or on road. Remaining safe is important not just for you but also for other people because the issues of safety are prevalent everywhere regardless of whether you are at home or moving around on the roads. People frequently call safety meetings to ensure that everyone is safe and sound in their premises. Safety meetings are regularly held by people to ensure the safety of others and themselves in every condition. It is important for people to follow a set of rules to remain safe and also keep others safe as well. 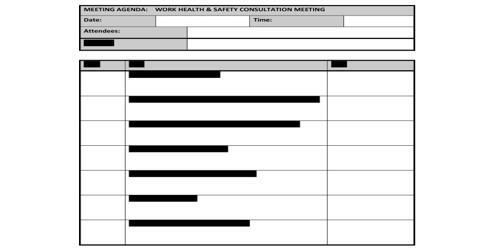 As safety meetings relate to the well-being of the individual it is essential for them to be held in a proper manner and the best way to go ahead is to create a safety meeting agenda which will detail the kind of measures people need to adapt to safeguard themselves. It is the employer’s responsibility to ensure workers’ safety in the workplace. Fire is hazardous and there are different ways to deal with it as well. There are different safety measures for fires caused by electricity, flames, and heat. So, you need to inform people about each measure and encourage them to act in time. The purpose of a safety committee is to reduce the risk of workplace injuries & illnesses, inform and educate the employees about safety and health issues throughout all levels of the company, and to set meaningful and attainable goals for safety throughout the organization. It is common for people either to remain at home or to move around for various reasons. Children need to attend school, employees to go to work and others for shopping, traveling and countless other reasons. Children can have accidents in schools when they are not supervised appropriately, employees may come across unsafe work environments and travelers could be victims of accidents despite precautions being taken by the road safety department. Accidents can happen everywhere and a safety meeting is generally held to warn people of the measures that can adapt to prevent them. Apart from children who need to be supervised by their teachers or caretakers, the others need to understand how following the safety measures suggested can prevent them from getting into trouble which can prove expensive. A safety meeting agenda is written to all people who are interested in safeguarding themselves and is not directed against any particular individual. Employers may hold meetings to warn employees about the care they need to exercise while working. The safety meeting agenda can be written by an individual who has been assigned the responsibility of doing so for the benefit of the general public or even employees and children. The individual writing the agenda must consider whether the meeting has been scheduled to discuss matters related to workplace safety, fire safety, vehicle safety or in places with extreme weather conditions even with concerns related to the weather. However in either of the above cases, it is necessary for the individual to prepare the agenda specifically for the subject which is scheduled to be discussed. The agenda must provide people with the tools needed to come prepared for the meeting while making it known to them that the meeting is being held solely for their benefit.